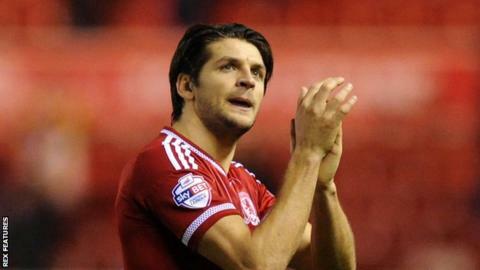 Middlesbrough defender George Friend says they can repeat their run from this season's League Cup in the FA Cup. Boro, who face Burnley in the FA Cup third round, beat Manchester United to reach the League Cup quarter final. "You've got to beat what's in front of you and earn the right to get that fixture that you want in the next round," Friend told BBC Tees. "When you see the fixture come out you do hope it's a Premier League team or someone lower down." Last season, Middlesbrough beat the then-reigning Premier League champions Manchester City in the fourth round before losing to Arsenal in the next round. As well as reaching the quarter final of the League Cup this campaign, Boro have also won seven of their last eight league games which has seen them open a four-point gap at the top of the Championship. "We've gone quite far in the League Cup so why not the FA Cup as well? It seems like an easy opportunity to get a better draw," Friend added. "It would have been nice to have gone straight into a league game with everyone high on confidence but the FA Cup is a special tournament and it's a competition in which we can go far." Friend also sees the cup as a chance for some of Boro's squad to better understand the English game. "There's something special about the FA Cup and for the foreign boys coming in, they don't know a lot about it. They've really savoured the opportunity to go into these great grounds and play lower teams to get a flavour of English football."